There’s nothing like a few blood oranges and a shot of liquor to spruce up an otherwise ordinary bowl of flour and eggs- am I right? 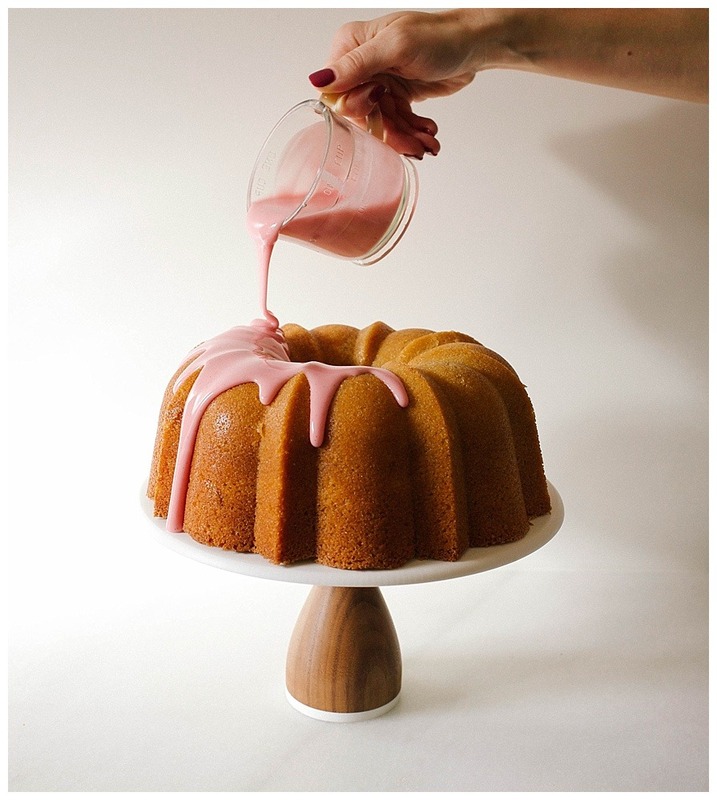 Ingredients like these take cakes from average to amazing, so I’m thrilled the share a treat like this blood orange bundt cake with you today! Living in a fairly rural area of lower Alabama, I often have a hard time finding exotic ingredients at my grocery store. Just to be clear: I’m using the term ‘exotic” loosely here. I’m not talking ostrich eggs or black truffles or even something as basic as a tub of mascarpone cheese. In these parts, it’s a stretch some days to even get my hands on a gallon of organic milk or a bag pine nuts, okay? We’re a one grocery store town (two if you count Wal-Mart, three if you count that guy who sells watermelons and sweet potatoes out of the tailgate of his truck), so while I am a far cry from being a pioneer woman, I still have to get kinda creative with my ingredients sometimes. Last fall, our grocery store randomly got in a shipment of leeks and I remember feeling like it was Christmas morning. Holding back tears of joy, I called a few girlfriends exclaiming, “They (sniff, sob)… have (gasp for air, more sobs)… LEEKS!” I’m pretty sure I bought three bunches of those little beauties, and Brett and I ate potato leek soup for like two weeks. Unfortunately, our plumbing hasn’t been the same since the leak incident of 2016. RIP. Then there was the day they started carrying my favorite brand of kettle corn. When I spotted that beautiful lavender colored bag on the bottom shelf, you would’ve thought Charlie had found Mr.Wonka’s golden ticket. I dropped whatever off-brand bag of potato chips I had been considering and raced to the popcorn shelf for a closer inspection. I can’t remember, but I think I cried real tears and then bought up the shelf of popcorn like I was stocking a bomb shelter. Don’t you dare judge me for it. Our little grocery store is small and humble, and to be honest, it can be really frustrating to not have immediate access to a lot of the ingredients that bigger stores probably carry (#firstworldproblems). But let me say this: the ladies at the checkout line know my children by name. My daughter is so obsessed with our store’s butcher that sometimes she will request a trip to the store just so “Aimee go see Willie, please mama?” I can walk to my grocery store in less than 15 minutes, drive there in less than 3, and even though it’s not much, I’d take my little hometown store situation over just about anything. Recently while shopping, I spied some blood oranges in the produce department. I sang the “Hallelujah Chorus” and promptly tossed a bag in my cart. I must have kept those oranges in my fridge for nearly a week before I decided what was worthy of its fancy juice and zest, and I’m happy to say that this blood orange bundt cake is the product of those efforts in the kitchen. A fluffy butter and egg filled batter, scented with vanilla bean and citrusy zest, this blood orange bundt cake is the best case scenario for any bit of prized produce hanging out in your fridge. This cake takes the juice and zest of quite a few blood oranges, so it is perfect for using up all of that wintertime citrus. To make the blood orange bundt cake, we start by combining a number of basic dry ingredients- flour, sugar, baking soda… you know the drill. Once well combined, we toss in a few chunks of butter and allow that to incorporate until it’s pea-sized crumbles. The blood orange juice, eggs, and zest are combined with a bit of orange liquor, and that wet mixture is added to the cake. Once whipped to a smooth and fluffy finish, the batter is poured into a large bundt cake pan and baked in the oven until golden and fragrant. I decided to top this blood orange bundt cake with a simple glaze made of blood orange juice and powdered sugar. 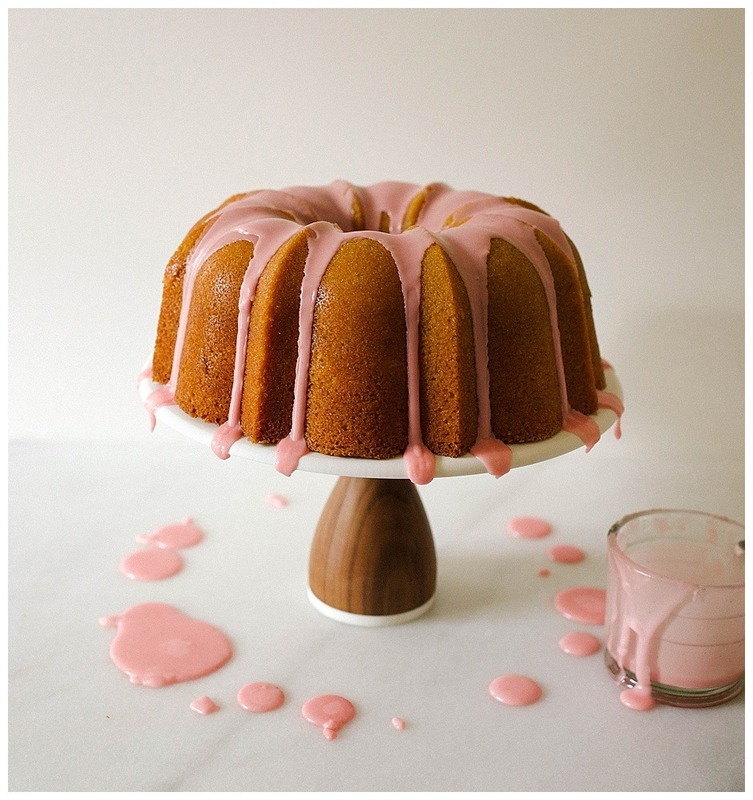 The blood oranges lend a rosy hue to the glaze, and while a bright pink frosted cake is rarely an elegant treat, I can promise that this cake is one all the grown-ups will write home about. It has a tender and moist crumb, an understated citrus kick, and just the right amount of sugar to make this cake perfect for breakfast or dessert. BONUS: If you, like me, live in a slightly rural area with limited access to special fruits like this, take heart! I have tried this cake with navel and mandarin oranges and I can vouch for both as substitutes. This blood orange bundt cake is a seasonal way to spruce up your baking game and I hope you’ll give it a try. Experimenting with new flavors, even ones that maybe aren’t so “exotic” like the citrus in this cake is an incredibly fun way to spend time in the kitchen. 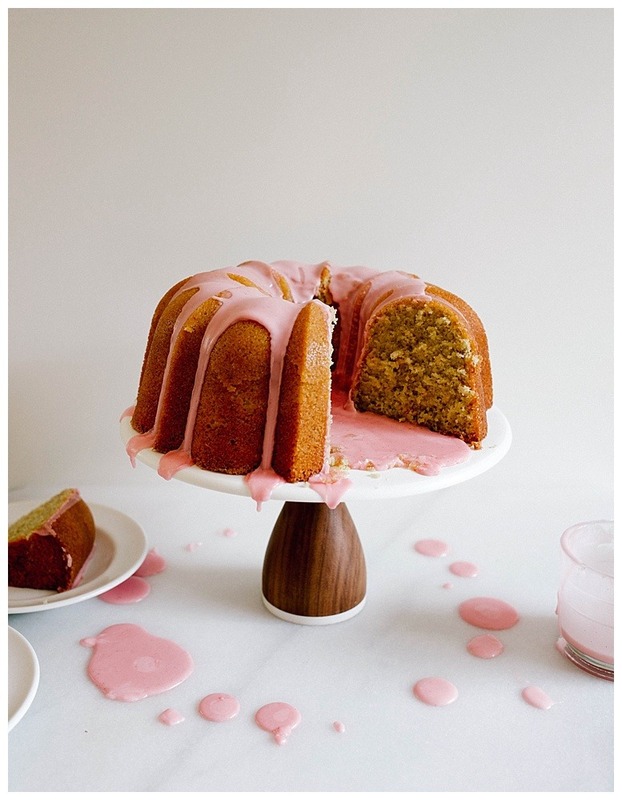 If you happen to spot a bag of blood oranges at the store this week, you should grab one and give this cake a try. Oh, and if you happen to be shopping at my local grocery store, you better get there quick before I buy up their stock of blood oranges. 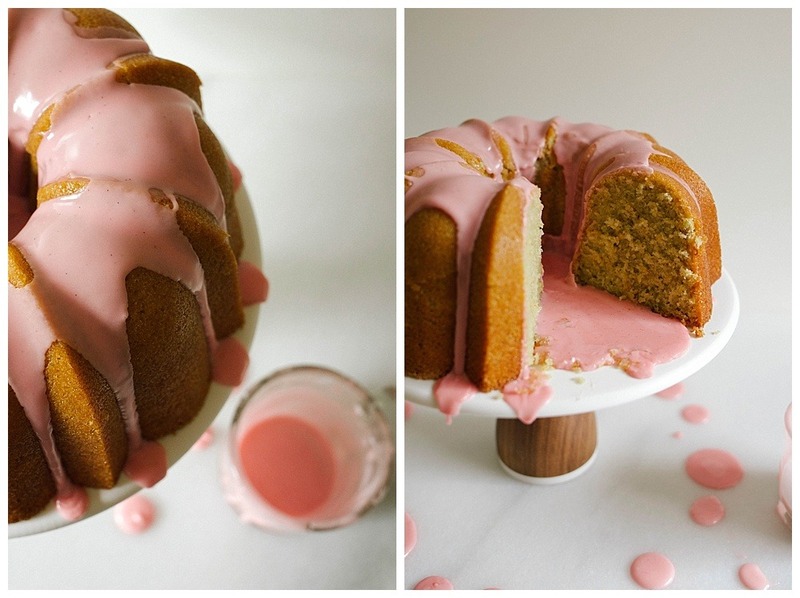 This blood orange bundt cake is a sweet and citrus cake that is perfect to share with a crowd! Serve for breakfast or dessert. Preheat the oven to 350 degrees and liberally grease and flour a large 15 cup bundt cake pan. Stir together the eggs, vanilla, blood orange juice, zest, and liquor in a bowl or measuring cup and set aside. In the bowl of a stand mixer, or a large mixing bowl, combine the flour, sugar, baking powder, baking soda, and salt and stir on low until combined, about 30 seconds. Keeping the mixer on low, add the butter one tablespoon at a time and continue to beat until the mixture is uniform and in peas-sized crumbles. Increase the speed to medium (about 4 on a stand mixer) and slowly pour in the egg and juice mixture. Continue to beat until the batter is uniformly moistened, smooth and fluffy, about 2 minutes. Pour the batter into the prepared pan, smooth the top, and bake in the preheated oven for about 1 hour, or until an inserted toothpick or cake tester comes out clean. Allow to cool on a cooling rack for about an hour and then carefully invert on the rack to continue cooling completely. Combine all three ingredients until no lumps of sugar remain. Add more sugar to thicken glaze slightly and add small amounts of juice, milk, or water, to thin the glaze out. I prefer to keep mine rather thick so that it will thickly coat the sides of my cake. 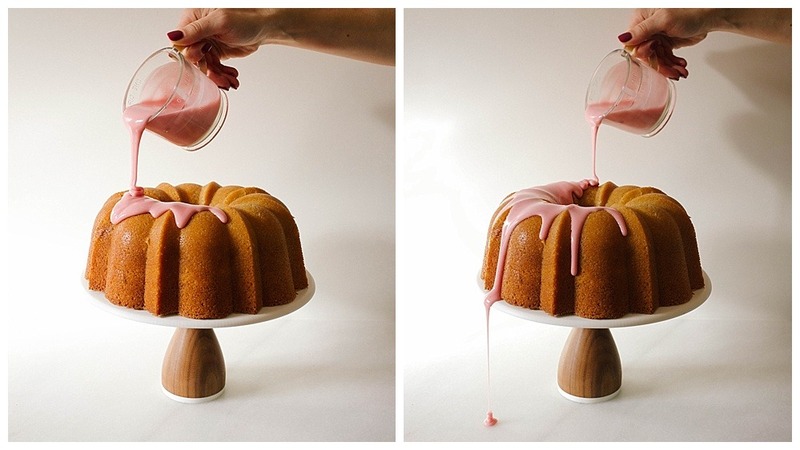 Once the cake is cooled completely, pour the glaze over top and allow it to drizzle down the sides. Store at room temperature for up to three days. This recipe is intended to be prepared in a large, 15 cup bundt cake pan. Do not fill the pan more than 3/4 of the way full or it will overflow! Pour extra batter in a cupcake pan and bake little blood orange muffins. Test the viscosity of your glaze this way: run a spatula or your whisk through the glaze. It should be just thick enough that the line you dragged through the glaze nearly disappears after about 10 counted seconds. Add more powdered sugar to thicken, or more juice to thin. Made this for mothers day and it was a hit! Love love love this recipe!! Your description says “scented with vanilla bean and citrusy zest” but there is no vanilla bean in the recipe….just vanilla in the glaze. I am the queen of blood oranges lately! 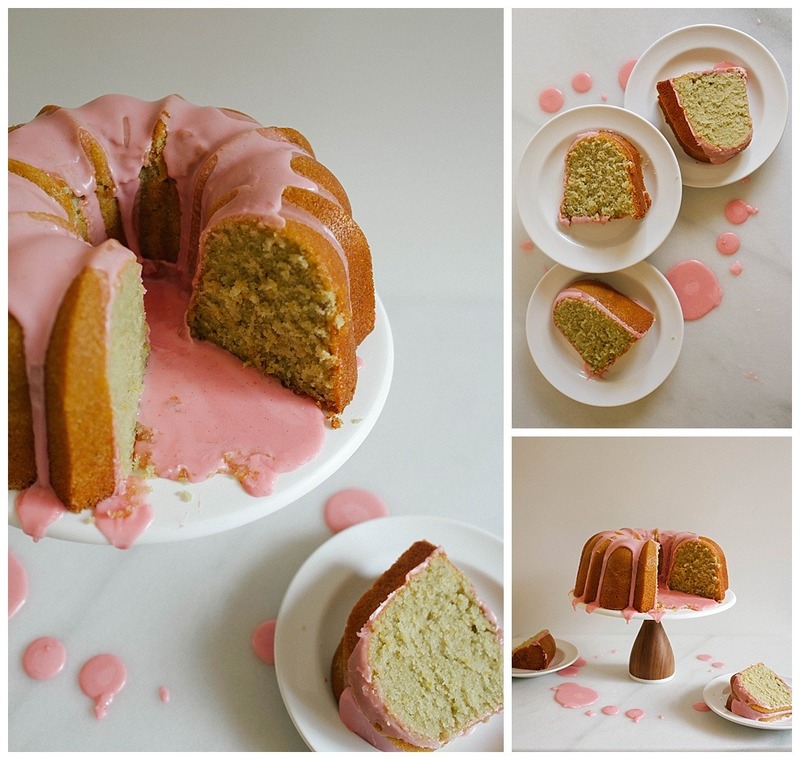 I will try this bundt today with the last of my precious citrus! 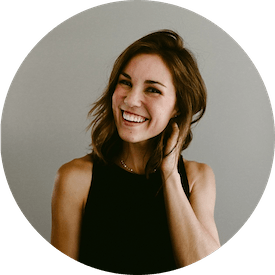 I just discovered your lovely blog via instagram (feedfeed). Hooray! I’m so glad you stopped by. Aren’t blood oranges the best? They someone seem, exactly as you put it, precious and valuable. Enjoy and lmk how it turns out! The next question is – how many bags do I need to buy?? I don’t think one bag will cut it. 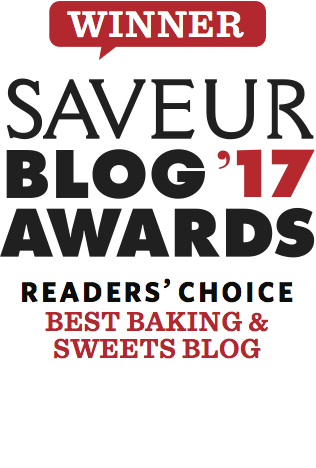 i’ve lived in fairly urban areas, but i still get excited about unique ingredients and gush about them to whoever (and these people typically know to just nod and let me prance around screaming about these things). when french toast crunch cereal re-emerged, my mom bought me a box, and i couldn’t stop thanking her or talking about it for at least a weekend.